Boss seal O-Rings are typically used in hydraulic applications, specifically for use in sealing straight thread tube fittings in a boss. The AS568 specification calls out specific sizes for these boss O-Rings and designates them with "900" series numbers. 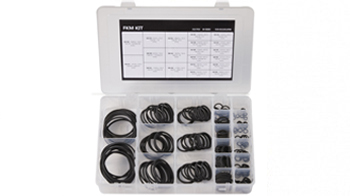 The Boss O-Ring Kit features 212 O-Rings in all twenty AS568 sizes. The kit is manufactured with solid grey plastic styrene and features post and recess style O-Ring retention. Also included is a brass O-Ring extraction tool. Depending on the application, there are two different materials to choose from: 90 durometer nitrile or 90 durometer fluorocarbon.